Buffalo Bill’s Antlers Inn offers doughnuts and hot coffee in the lobby every morning. All rooms have wireless internet available on site, cable TV and coffee makers in the rooms. 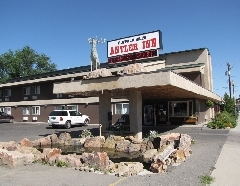 The hotel offers rooms including singles, doubles or a Jacuzzi Suite. Two rooms are especially equipped for handicapped visitors. Each room has individually handcrafted furnishings designed and built after the historic works of Thomas Molesworth. Open May-October. No Pets.